Were 2019's First Three House Bills for Impeachment, an Electoral College Ban, and Foreign Aid? - Truth or Fiction? A highly popular meme inaccurately characterized the Democratic Party’s first three bills of 2019. The first three bills introduced by House Democrats were to impeach the President, abolish the Electoral College, and dole out $54 billion in foreign aid. Of first note is that Schumer is a United States Senator and is thus not in the House of Representatives; Pelosi is a Congresswoman. 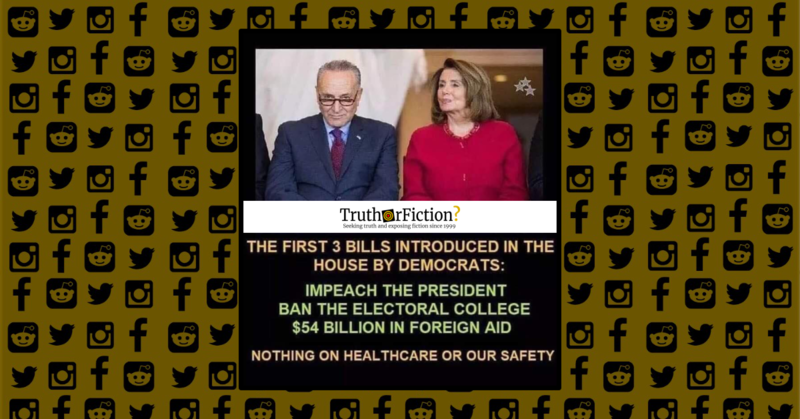 The meme claimed that House Democrats introduced three purported bills in the start of their session in 2019 — one to impeach President Donald Trump, another to ban the electoral college, and a third pledging $54 billion in foreign aid. No citations, news articles, or other information substantiating the claim appeared alongside the meme, and commenters largely decried the purported priorities of House Democrats. But was it true that those were the first three bills they introduced? A bill making appropriations for the fiscal year ending September 30, 2019, and for other purposes; to the Committee on Appropriations, and in addition to the Committee on the Budget, for a period to be subsequently determined by the Speaker, in each case for consideration of such provisions as fall within the jurisdiction of the committee concerned. considered and passed. This section of the bill would provide $54.4 billion in fiscal year 2019 funding for the State Department, an amount equal to the prior year, to carry out diplomacy, promote democracy, provide assistance to allies, and global health programs to help the world’s most vulnerable populations. A bill to require certain additional actions in connection with the national emergency with respect to Syria, and for other purposes; to the Committee on Foreign Affairs, and in addition to the Committees on Financial Services, and the Judiciary, for a period to be subsequently determined by the Speaker, in each case for consideration of such provisions as fall within the jurisdiction of the committee concerned. Separate joint resolutions were introduced on that day, including H.R. 13 (“Impeaching Donald John Trump, President of the United States, for high crimes and misdemeanors”) and H.J.Res 7 (“Proposing an amendment to the Constitution of the United States to abolish the electoral college and to provide for the direct election of the President and Vice President of the United States.”) Both were sponsored by Democrats and introduced on the same day as the three pieces of legislation first introduced. However, the meme’s central claim is easily proved false. The first three bills introduced by House Democrats in 2019 were not foreign aid, impeachment, and abolishment of the electoral college; they were voting access, appropriations, and a bipartisan action on Syria sanctions. H.Res.13 - Impeaching Donald John Trump, President of the United States, for high crimes and misdemeanors. H.J.Res.7 - Proposing an amendment to the Constitution of the United States to abolish the electoral college and to provide for the direct election of the President and Vice President of the United States. Does Fentanyl-Laced Marijuana Smell Like Popcorn?